Palmako Irene 27.7 Log Cabin is a beautiful Double Glazed 70mm log cabin. 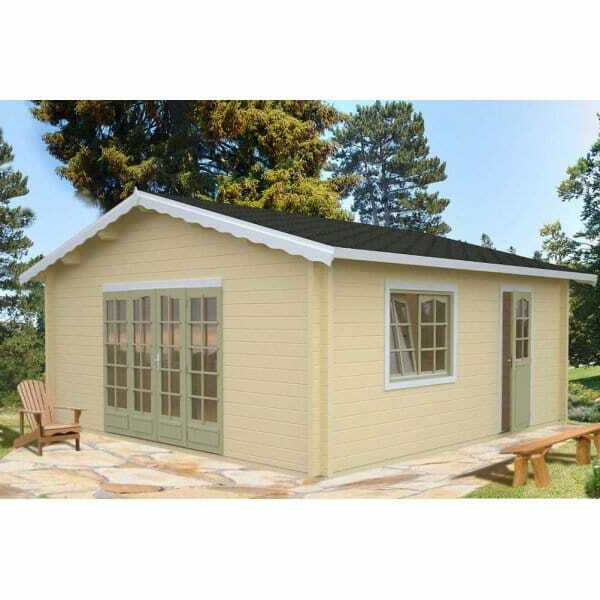 This Large cabin is light and Airy due to the Double Doors and Large Windows an Ideal Garden Office or Workshop. A beautiful addition to the garden with a variety of uses. It features 70mm wall planks, Double Glazed Opening doors, double opening at the front of the cabin and a single door to the side. A double tilt and turn opening double glazed window. NOTE: The cabin can be supplied with optional Bituminous Felt (Shed Felt) Roofing or Bitumen Felt Shingles in a Choice of Green or Black. Shingles supplied are square ended and NOT Shaped as shown in the image. Please Note: In Common with Most Log Cabins This Log Cabin is Delivered un-Treated and will Require the Application of a Good Quality Timber Preservative. Showing our 2 Palmako Irene 27.7 Log Cabin with Double Glazing reviews with an average rating of Excellent. Would you like to write a review?